It will be another windy day in South Florida Thursday as early temps in the upper 60s and lower 70s will head up to about 80 degrees by the afternoon. Though much of the day will be dry, isolated showers are possible during all time periods and an umbrella will come in handy. Winds will range from 15-20 mph with stronger gusts. Advisories hold for the local waters, and dangerous rip currents are likely at the Atlantic beaches. Skies will stay partly to mostly cloudy, though more breaks of blue than we saw yesterday are expected, also fewer showers. 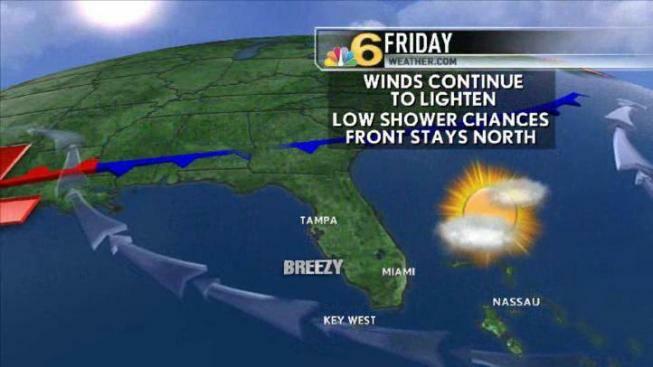 We’ll go from a 30 percent chance of showers Thursday to only a 10 percent chance Friday. Winds will begin to lighten tonight.